CONFECTIONERY COMPANY BRODERICK’S plans to generate more than half its revenue from exports in 2019 after a costly period getting a new production base up and running. 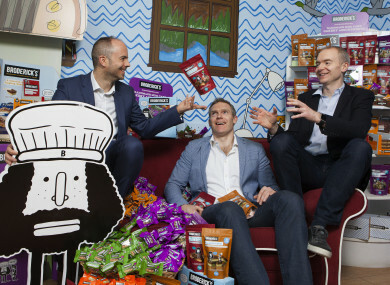 The company opened the doors on a new facility in Tallaght in 2018 with the intention of ramping up production of its snack products, particularly in international markets. It raised €6.3 million to fund the endeavour from investors including the State-backed BDO Development Capital Fund, a multimillion-euro fund that invests in profitable, medium-sized exporters. With the new production base and increasing international efforts, Broderick’s said in the directors’ report accompanying its latest financial results that the company has gone through a “significant change”. However it encountered some delays in getting the facility operational – it wasn’t fully up and running until early 2018 – which resulted in a “disappointing” financial result for 2017. The accounts for Ina’s Kitchen Desserts Ltd, which cover the year ended in December 2017, showed that the company behind Broderick’s generated revenues of €8.5 million but recorded a loss of €1.8 million. “This loss reflects the exceptional costs associated with moving to and commissioning the company’s new premises and production facilities during the year,” a spokesperson told Fora. The larger production base in Tallaght is able to handle the greater volume of orders domestically and internationally, the company said. Since moving to Tallaght, Broderick’s has secured new contracts in the UK, Sweden and the Netherlands. It is already exporting to more than 24 countries across the US, Europe and the Middle East. The spokesperson said that export revenues are targeted to form around 54% of its total revenues in 2019. According to the 2017 results for Broderick’s, the cake maker generates sales of €4.3 million outside of Ireland – a little over half of its total turnover. Along with targeting more international business, it has diversified its product line to include more healthy snacks. The business also provides in-flight snacks to several airline customers such as Emirates and American Airlines and sells treats under various other brand names including the Irish Flapjack Company and Ina’s Handmade Foods. The family-owned food business is headed up by brothers Barry and Bernard Broderick and was founded in 1984 by their mother Ina. It has 108 staff on its books. Email “After a 'disappointing' year, Broderick's aims to ramp up exports from its Tallaght plant”. Feedback on “After a 'disappointing' year, Broderick's aims to ramp up exports from its Tallaght plant”.